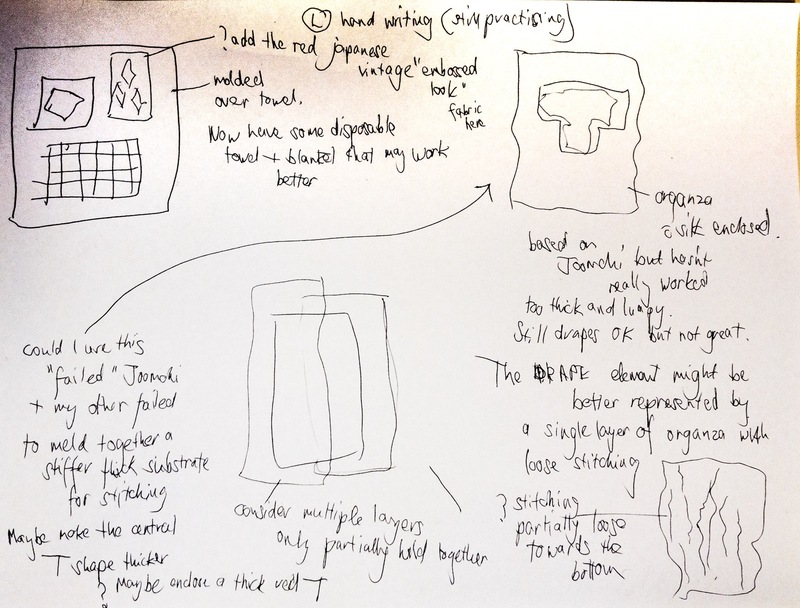 Part Two Reflection on the course so far and my evaluation of my works against the assessment criteria. I’m really enjoying the course so far and the graded entry into textile work has been good for me. Closely observing my textiles has resulted in many ideas for my own textile work as well as simply seeing interesting lines and detail that had previously gone unnoticed to me. I gained a lot from the paper manipulation section of this unit. The ease of manipulating paper made me push harder to entertain ideas about what could be done with textile beyond my cut and paste quilting background. 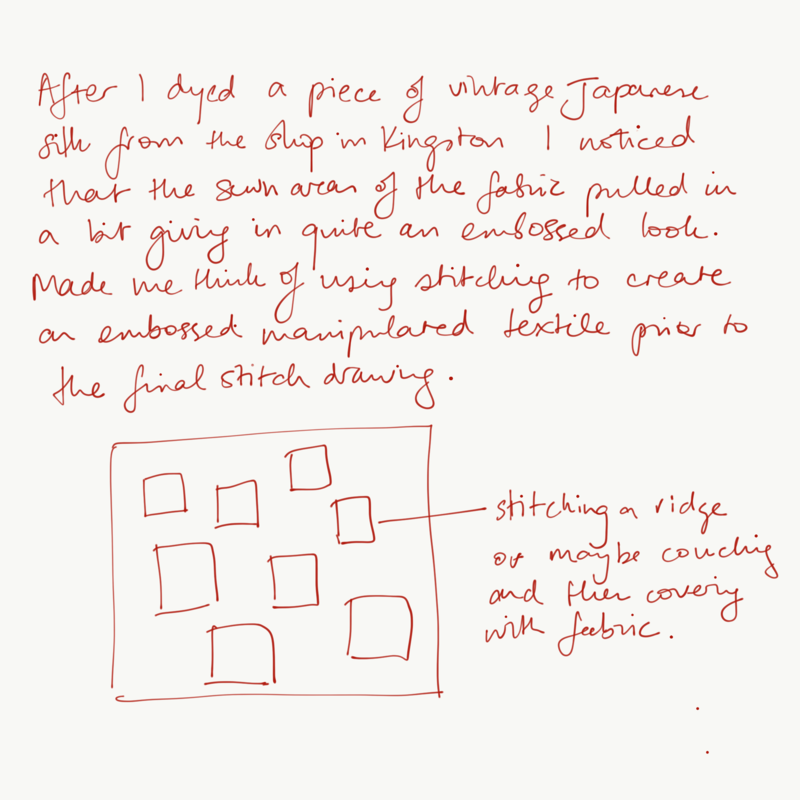 Similarly attempting to draw with stitch rather than embroidery gave me a new perspective on stitch and freed me from the constraints of regular embroidery stitches. Although I did use some traditional stitches to achieve the effects I wanted, I also realised that I could stitch freely and loosely, simply applying lines and texture with thread rather than thinking of it as embroidery. I tried to relax and to some extent let the stitches fall where they may as the lines do in expressive drawing, rather than keeping rigid control of the stitching. 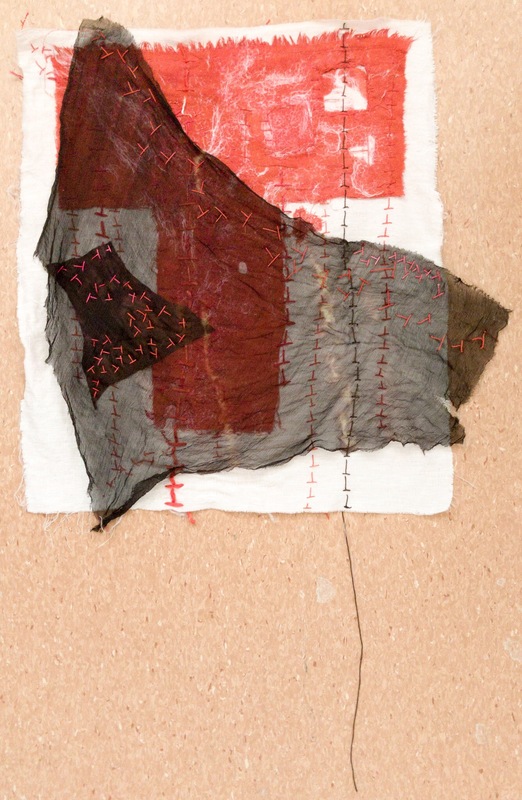 I was a bit less happy with my final textile works, than I was doing the paper manipulation and stitching on paper. This often happens to me when I try to work on a single large work that is intended to be a more resolved work. I seem to freeze and am less adventurous in my approach compared to when I am working on “testers”. I am fearless when it comes to experimentation in the lead up to attempting more resolved works, but final works tend to be more contained and often less interesting. One way I try to get around this is by prolific making of smaller units. Following this I can make choices about inclusive or not of these smaller units directly into the larger work. 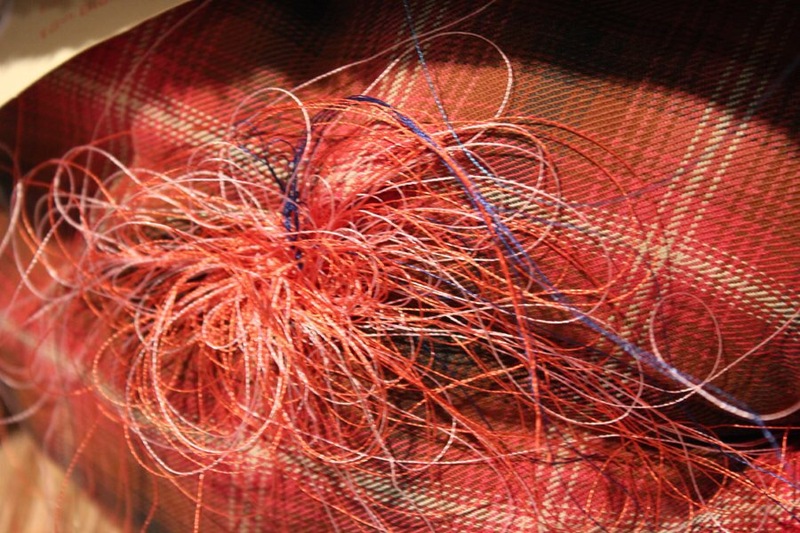 I have always been drawn to textiles as they allow for this way of working more easily than paper. It would be good for me to try and allow the same freedom and experimentation to come through in my larger individual works. Demonstration of technical and visual skills – Materials at my disposal here have been somewhat limited, but I did plan ahead and bring materials I thought I could use, and as such I believe I was able to make good use of locally sourced and my own materials. I think I have quite good technical skills with wide ranging experimentation and lots of technical ideas. My observational skills and visual awareness have been developing over the course of this unit, but probably more generally over the last few years in the context of my other tertiary visual art study. I have found that I am quite amazed how ideas based on observation are now generally too many rather than too few, and I’m in danger from leaping to one to another without fully resolving anything. As far as design and compositional skills go I am pretty two dimensional in my ideas and often forget to consider depth and interaction between design elements fully. 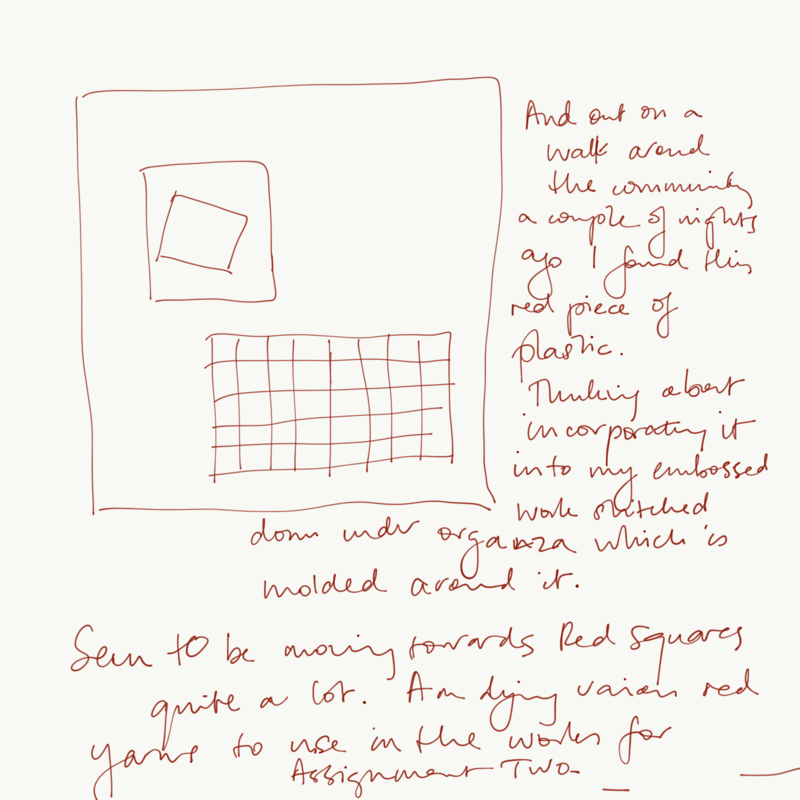 I am not as accomplished with composition and design as I would like to be and tend to think in terms of rule of thirds from photography and containing geometric design within a frame as in traditional quilting. I have tried to push beyond this a bit with my current works but it is an area I find more difficult. Quality of outcome – Here I am pretty dubious. I was not very happy with my final works, although I did manage to improve them to some extent as I went. If I am ruthless I could describe my works as a messy jumble of rag, a kindergarten wall hanging and a tatty scarf. The series holds together in terms of colour, and has resulted from an application of techniques and ideas previously developed through the course, but I can’t really see much communication of ideas in this work and as such it leaves me a bit cold. 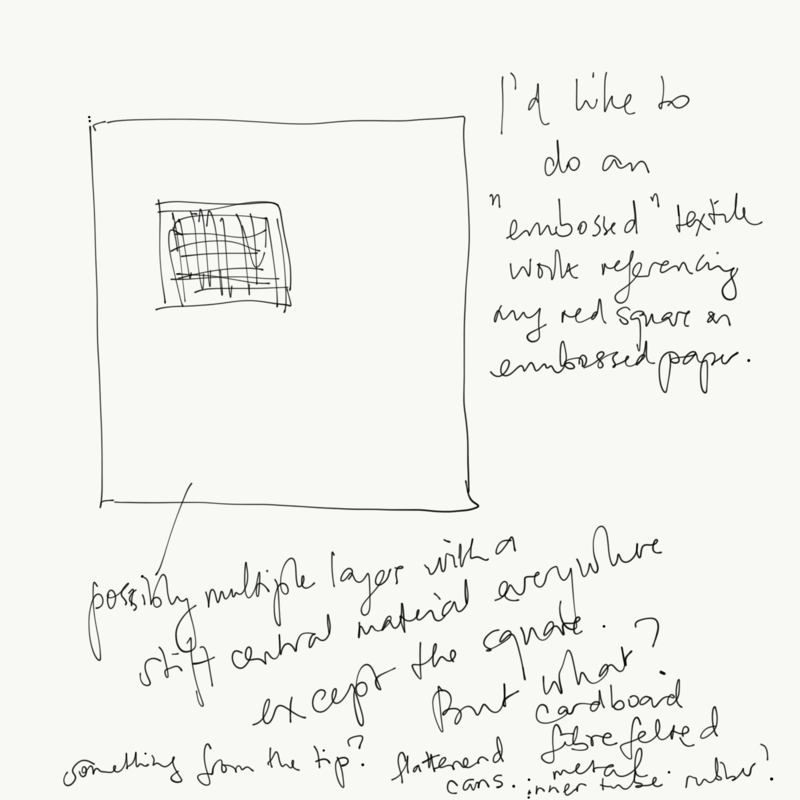 Possibly I have overanalysed the inclusion of ideas from the drawings to the point where they do reference the drawings but don’t go further at all to be expressive or meaningful works. Demonstration of creativity – I love to experiment and invent new techniques or adapt old ones. This is the area where I feel confident and relaxed, and the area that is most pleasurable to engage in. I’m not sure that these works show much development of a personal voice. They are not expressive, complex, serendipitous organic works which is what I gravitate towards, but I like to think of this as just a start, the tip of the possible iceberg. Context – Another area in which I struggle. I often find I want to be making, not researching, and yet when I research I do find that it opens up unimagined possibilities to forward my work. I haven’t done enough research in Part Two, but I hope to get that back on track. I think I can manage critical thinking but at times I also find that I spend too much work time in my head and perhaps I could spend more time thinking on the page, or the fabric. Author teallelePosted on October 25, 2017 October 26, 2017 Categories Assignment 2, Part 2, Research & ReflectionLeave a comment on Part Two Reflection on the course so far and my evaluation of my works against the assessment criteria. Looking for how they select, apply and alter their chosen materials. A interactive installation project whereby the artist mends textile articles brought to him by members of the public. Whilst he does this he chats with the owner of the textile and at the end the textile remains connected to its reel of thread on the wall. The repair is designed to be celebrated and visible and is seen as a gift. The intimate act of mending something that is often seen as an extension of self. Something to be displayed as evidence of a caring gift. 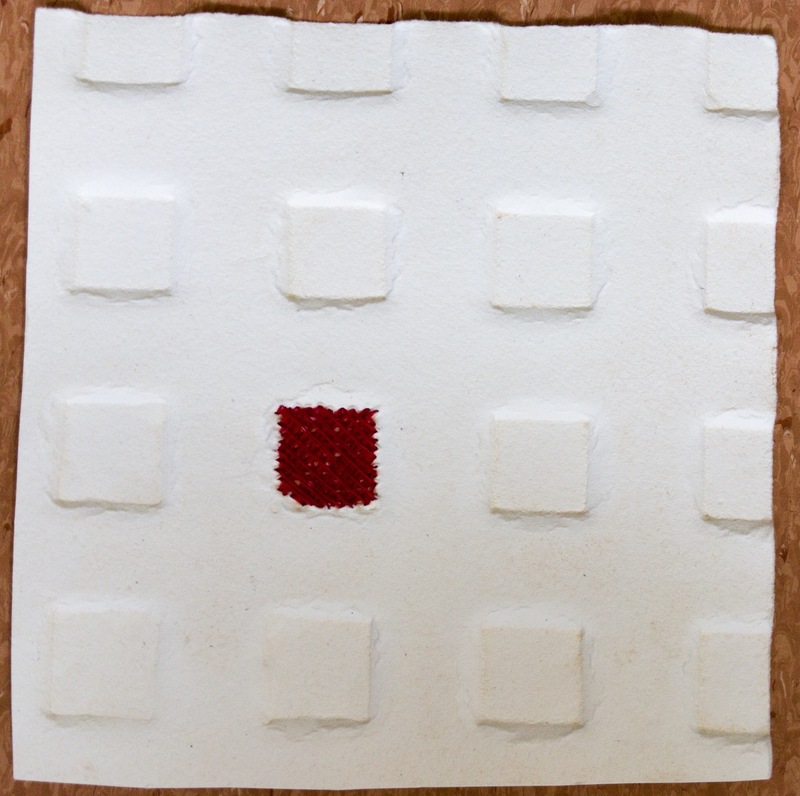 This artist does not select his textiles for this project but allows self selection by the public participants. He then uses thread that is chosen by the participant to repair the articles, often in a very visible and decorative way. 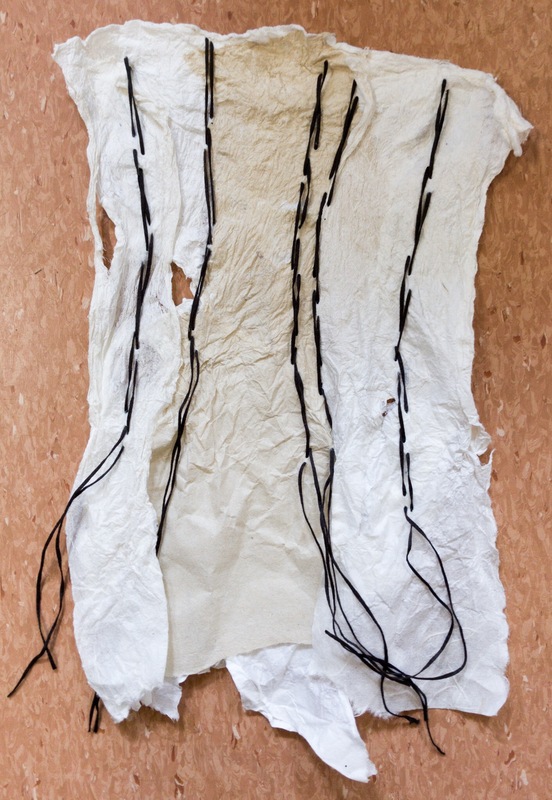 His art is about the gift of mending but also about the connections made during the mending process. 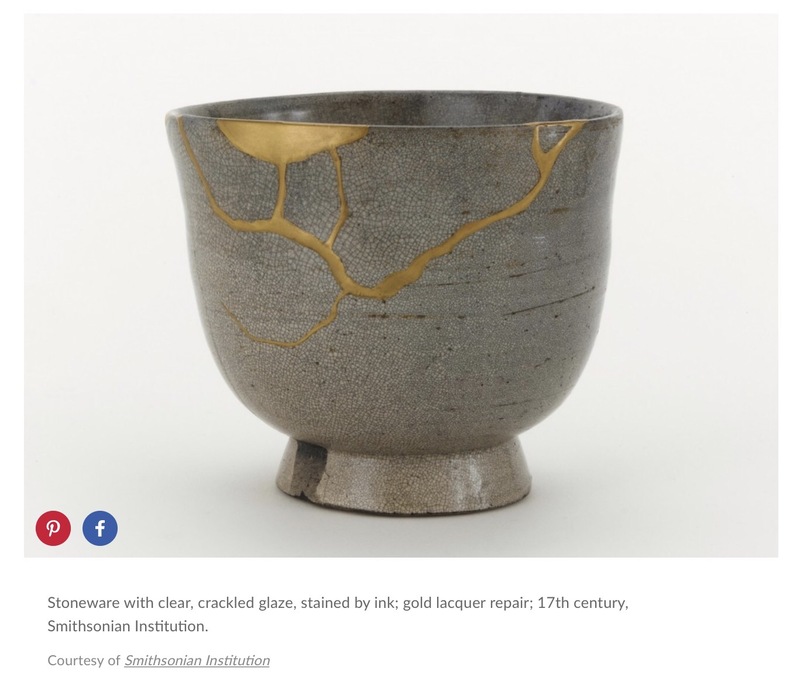 Ancient Japanese tradition of repairing broken ceramics with gold. 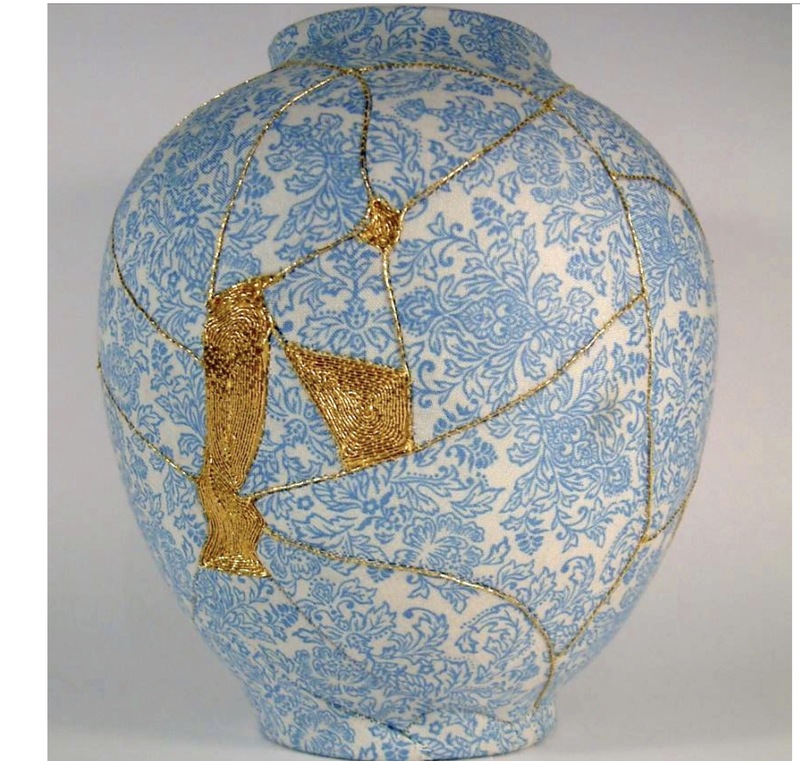 This artist has adapted Kintsugi to repair fabric covered ceramic pieces with gold embroidery thread. The idea of highlighting and celebrating the repair really appeals to me. The artistic form is defined by the serendipitous nature of the break or tear as is the artistic repair. 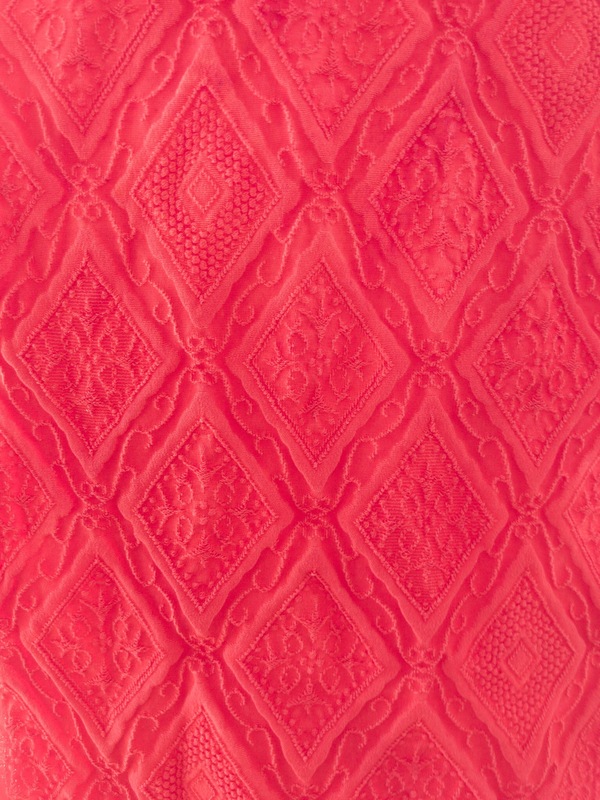 It’s a lovely way of allowing chance to reveal unimagined beauty, and one that could readily be applied to textiles. I love to incorporate chance in my work because of the unexpected and unimaginable (ie I couldn’t make it up) and the unique work that results. The combination of chance and considered choices results in the most complex and beautiful art in my eyes. Assembled this made from non woven material and an old towel as padding. Thinking of using this as an embossed work with a piece organza over the top and sew down around the shapes. Started to do this but unhappy with the clunkiness of it. Not possible to get the organza to sit tight enough to really give the embossed look. 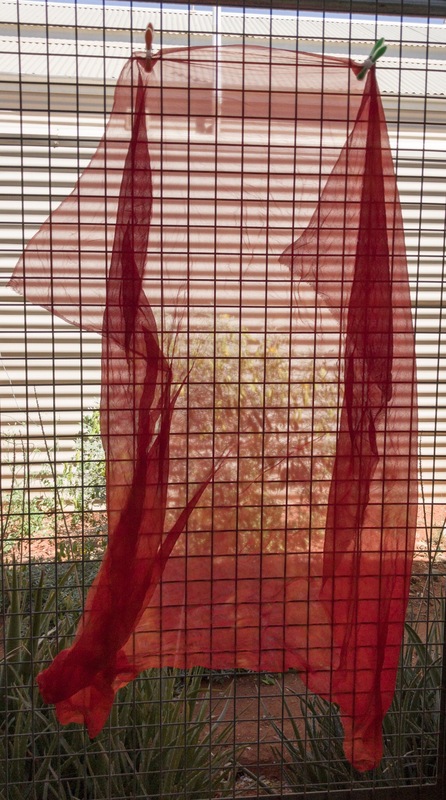 I like the look of the fine non woven net in the square which is not visible in the photo but also lost under the organza. Going to restart and this time cut a square out of a disposable towel I found at work and work a stitched net in the background. 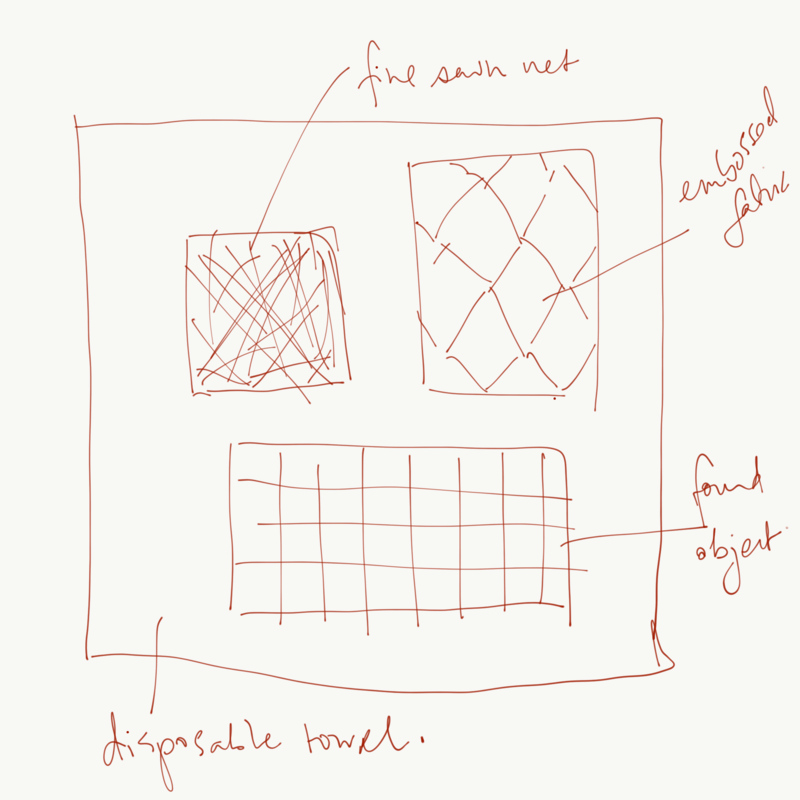 Considering using some of my embossed look fabric and my found red grid on the surface of the towel as other references to embossing. Using Joomchi like bonding I tried to bind two layers of organza with silk fibre in between. I did a lot of work on this and ended up having to machine stitch to hold the layers together anyway. They did not bond in the sculpted fashion that paper did. I wanted to use this because a lot of effort had been put in but it’s not right. 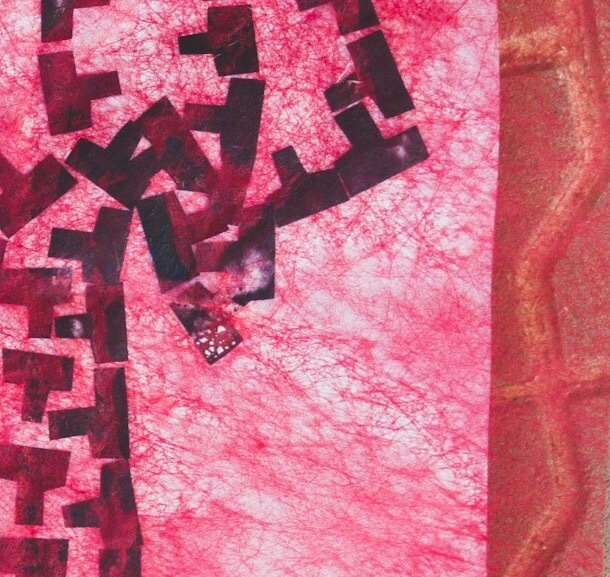 The thick lines do not evoke the fine mesh of my red collage or the drapy lines of the sewn paper sample. It doesn’t even refer to the graphic T shape because it’s so tatty. I think it needs to be put aside unfortunately. 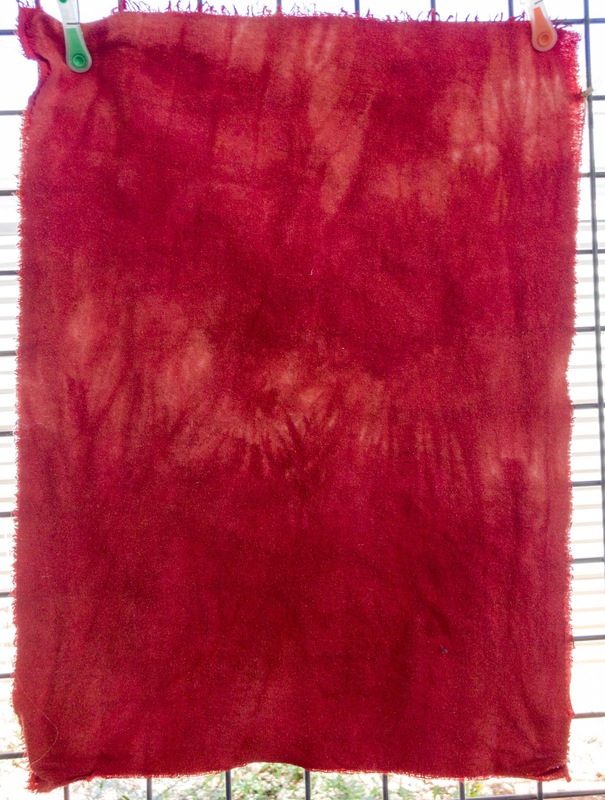 I think this large piece of dyed silk organza is what I will use instead. 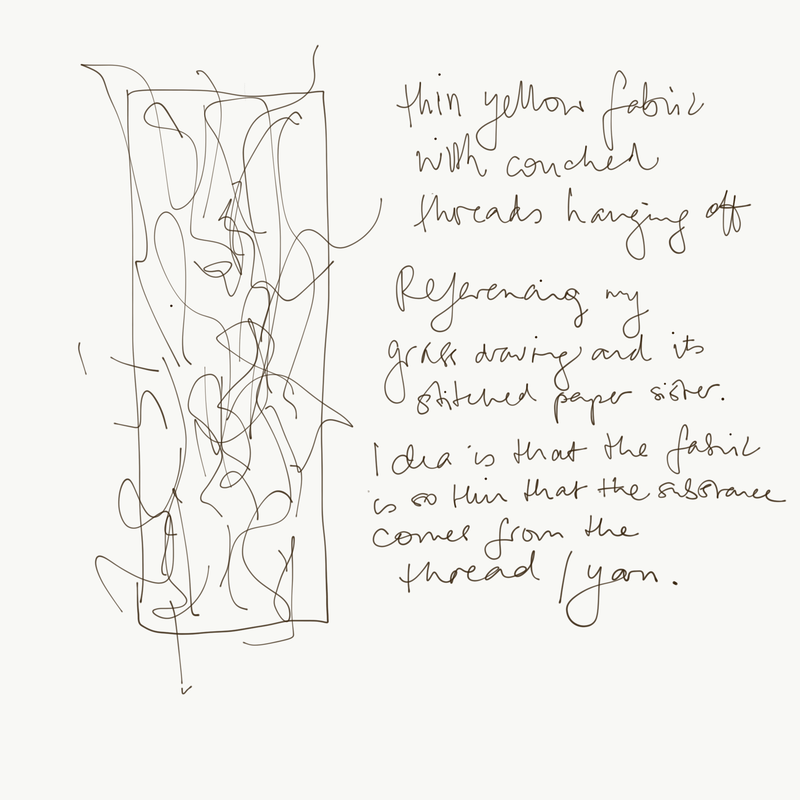 It is life size as clothing and I am thinking of sewing fine lines vertically with dark thread left to float free at the bottom. Simple sewing to highlight the drapy line. I’m thinking that because it is very thin material I will be able to utilise the fact that the lines will be seen from underneath as from the top. 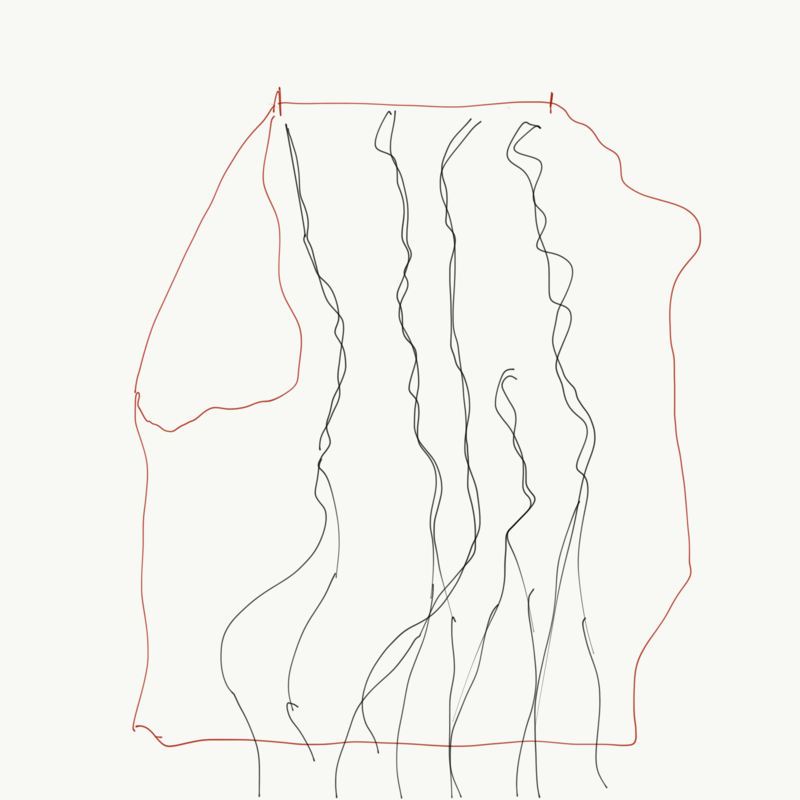 So will try intertwined lines as in my drawing and the paper sample. I’m aware that these are a series and thinking about linkage between the three. 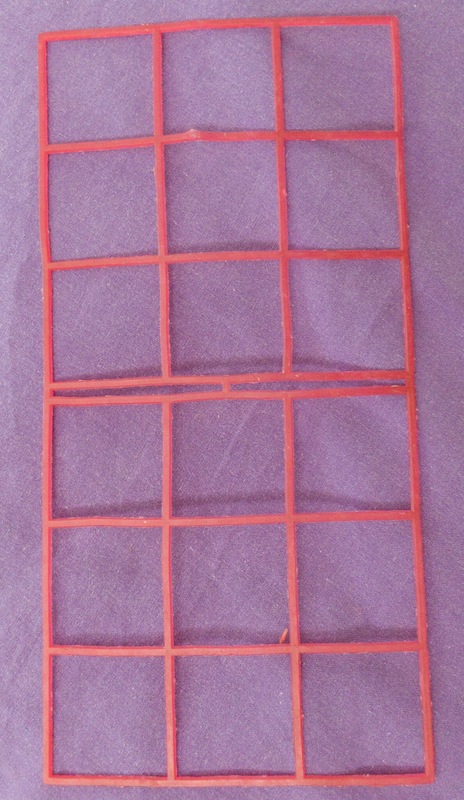 It is basically likely to be the red colour, and I plan to use only red and “black” thread. My black thread is hand dyed so it’s really more of a rich dark brown. I do have other threads with me too but I don’t usually work with much pure black. Here is another failed fabric Joomchi attempt. 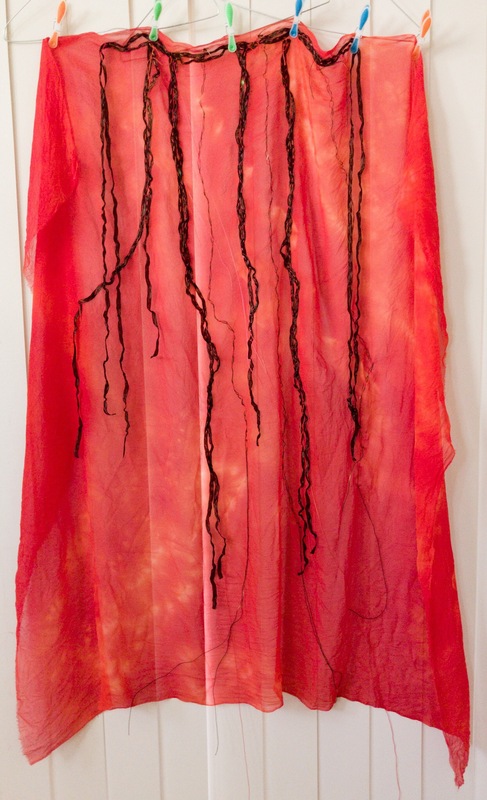 This is two layers of dyed raw silk that is bound together with milk silk. It is holding together enough to use but I have not been able to get the inner fibres to migrate to the surfaces. Thinking that I might be able to pull some of the fibres up with stitching. Plan here is probably to use this as a stiffer base. 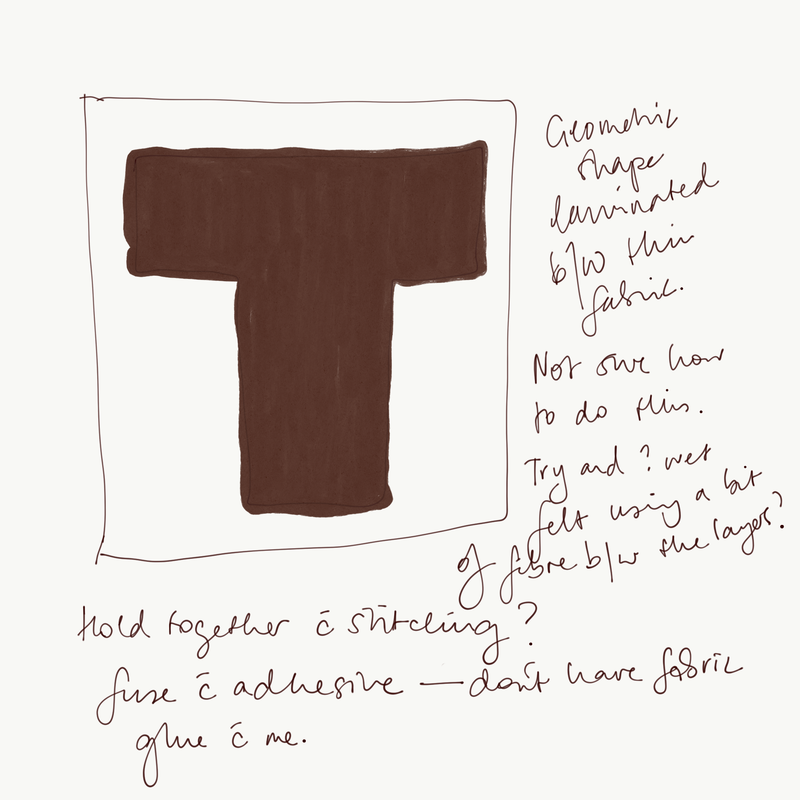 Possibly I will cut it into the T shape before stitching heavily over this with small stitches in the shape of a T possibly in a range of sizes or at odd angles as in my collage sample. I’m not sure but I need to get started with these or they will not be done in time. Starting to think about my final series of three works. These are the three works I think I’ll be using to inform my first textile works. 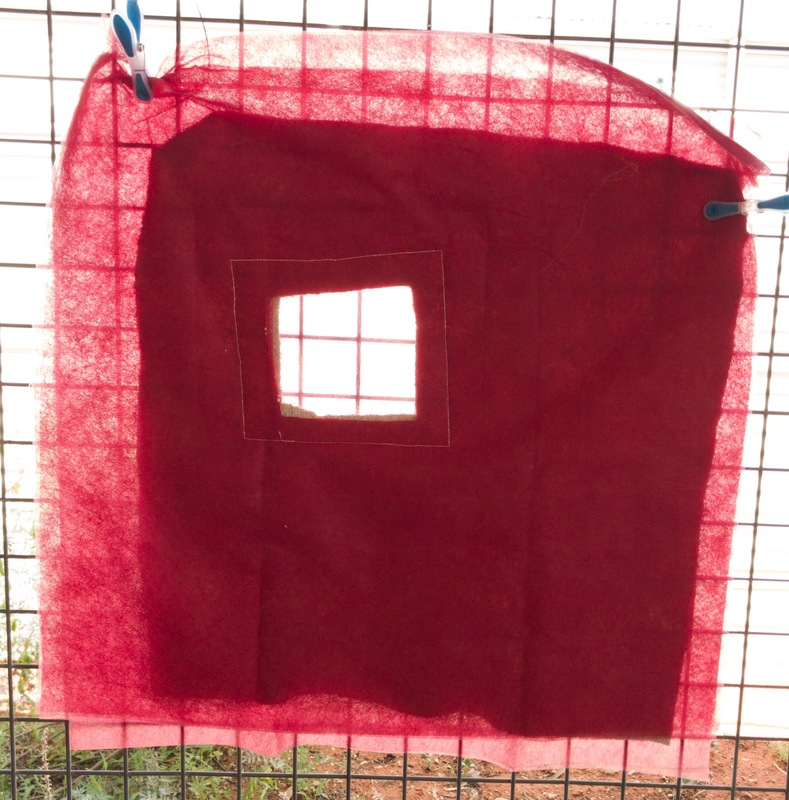 The features I am looking at are the embossing and the dense red textural colour in the first, the net overlay with something visible beneath and the kimono shape in the second, and the drape and linear marks of the third. Don’t know what this has come from. It was just lying on the ground in the middle of the road. There is a fair bit of discarded material on the ground here. Brian called our walk “going shopping for free art supplies”. Considering the need for some base textile to work on. 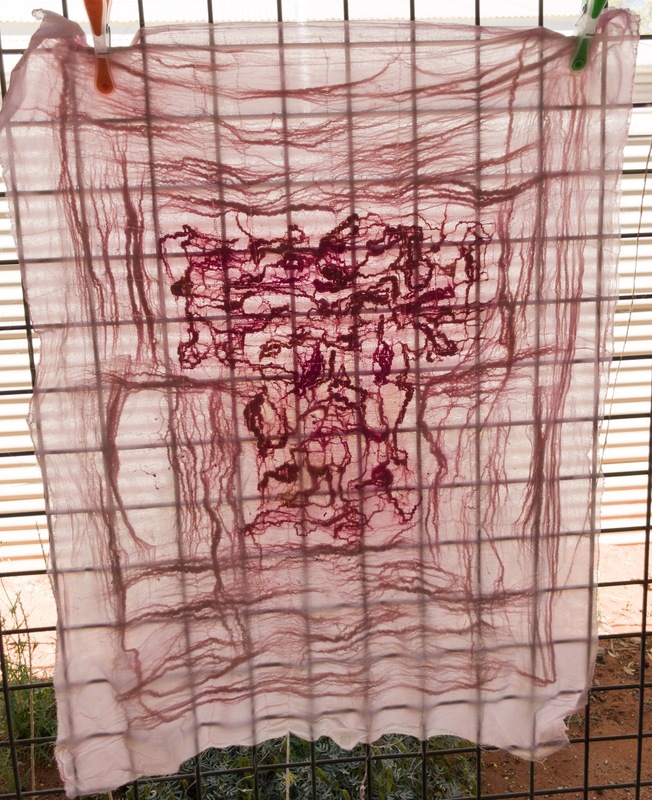 I am living remote at present and only have undyed textiles that I brought with me, and some dye. So before I think about manipulating the textile, I first have to consider what colours I would like to use in my base textiles. At this stage I’m not sure where I will be going with my textile works, but I can’t ignore my surroundings. I am draw to the distinctive colours of the outback, the red of the earth, the green of the plant growth and the blue of the sky. It’s going to be pretty hard to choose textile for my base because I don’t have much available and I understand that I am making links always back to my drawings or my stitch works so possibly I should be using my cream/ white fabrics undyed as paper is undyed. Actually reading the brief again I see that I should only be referencing colour in a limited way and relating it to the colours in my drawings. 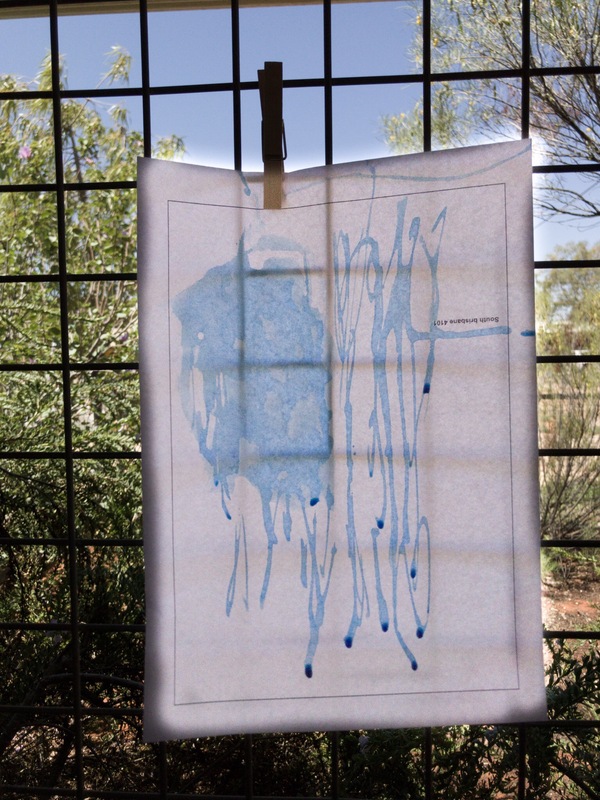 Still I’m going to have some fun dyeing some fabric to use at some stage anyway in the colours of the outback. I want to extend my work ultimately and apply what I’ve learnt to a body of work relating to my time here.